It was held pretty much local to us (in Lexington, Kentucky) at the Campbell House – a beautiful old hotel that was once a carriage house and is now a Crowne Plaza Hotel. 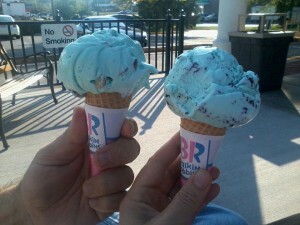 When the movie was over, we stopped for some ice cream. The weather was absolutely beautiful, and we sat outside and ate pistachio and mint chocolate chip ice cream on sugar cones before heading back to the hotel (and took the ONLY picture of the entire weekend – argh). The other couple were awesome. He is studying to be a chaplain, and she is a blogger! Come to find out, they also follow a Levitical, whole foods, real food diet! We became fast friends and I was so happy to discover that they are local to us, too. Her blog is SMASH (Save Money & Stay Home with Your Kids). I LOVE that her blog is an acronym (and those of you military spouses would agree, I’m sure!) and have added it to my blog roll so that if you’re looking for money saving information, you can add her to your list, too! Friday night, after the orientation, Gregg and I headed out for a late supper. Unfortunately, our car broke down while we were out. Even more unfortunate – there was a MASSIVE thunderstorm going on right at that moment – driving rain, high wind, serious lightening. So, we sat in our car, at the bottom of an exit ramp while people angrily honked at us as they went around us (though, to give one car credit – in the hour we sat there, one person did inquire as to whether we needed help) and chatted, enjoying the intimate time while we waited on the tow truck. Our friend who was watching the children came and picked us up at the repair shop and took us home so that we could get another vehicle. By the time we made it back to Lexington, we stopped at a Waffle House and had a steak and eggs dinner. At 10:30 at night, that was probably the best steak I’d ever eaten. Or, I was really hungry. Either way, we enjoyed our meal. Saturday all day was our retreat workshop. 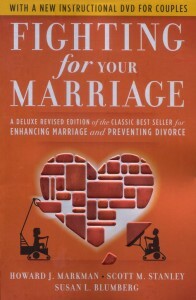 The base for the program was this book: Fighting for Your Marriage. The focus of the program was learning how to communicate, logically and unemotionally: one person speaking clearly without assumptions, the other person summarizing what the first person said so that both parties understand, etc. Then we talked about issues that arise during deployment (a unit is prepping to deploy) and reintegration (a unit had recently returned). We had a nice box lunch, a beautiful dinner, then had a date night. We did a little shopping, then went to see Snow White & the Huntsman — a movie that had some amazing CGI – the story was “eh – okay”, but the effects were brilliant and worth the price of the “cheap movie” admission. Sunday morning, there was a worship service that tied God into the elements that the book (a secular book on marriage) presented. We enjoyed that as much as the rest of the workshop, because Gregg and I believe that a strong relationship with God strengthens a marriage. Sunday concluded the workshop, and we left at lunch time. We enjoyed a lunch at a pizza parlour we’d talked often about wanting to visit. The pizza – a chicken, tomato, and fresh basil, was really good. After lunch, we did a little more shopping, then headed to a book store for a Bluegrass Christian Writers meeting. I love this group of Christian ladies and have thoroughly enjoyed both meetings I’ve had the privilege to attend. After the meeting we headed home. It was wonderful to see the kids and to go to church together as a family Sunday night. But, the weekend REALLY refreshed and rejuvenated Gregg and I. We absolutely needed that alone, married time. 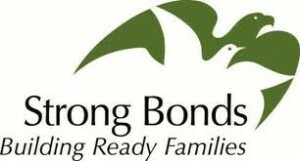 If you have an opportunity to go to a marriage retreat (and if you’re military, look at the Strong Bonds website and see what is near you) I thoroughly encourage it. You cannot imagine what alone, non-kid time, away from home and habits, can do for you and your marriage. We’re encouraged, rested, relaxed, and ready for the busy work/writing/school/volleyball/ministry year starting in the next two weeks. I keep forgetting you live up that way. :-) I’ll be at UK on the 25th of August for my sister’s graduation from medical school. Gotta eat at Chipotle.